← Trutino, John (ed.). Mexico and Mexicans in the Making of the United States. 2013. Castellanos, M. Bianet, Lourdes Gutierrez Najera, Arturo J. Aldama (eds.). 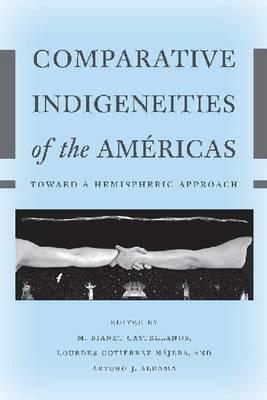 Comparative Indigeneities of the Americas: Toward a Hemispheric Approach. 2012. The effects of colonization on the Indigenous peoples of the Américas over the past 500 years have varied greatly. So too have the forms of resistance, resilience, and sovereignty. In the face of these differences, the contributors to this volume contend that understanding the commonalities in these Indigenous experiences will strengthen resistance to colonial forces still at play. This volume marks a critical moment in bringing together transnational and interdisciplinary scholarship to articulate new ways of pursuing critical Indigenous studies. Comparative Indigeneities of the Américas highlights intersecting themes such as indigenísmo, mestizaje, migration, displacement, autonomy, sovereignty, borders, spirituality, and healing that have historically shaped the experiences of Native peoples across the Américas. In doing so, it promotes a broader understanding of the relationships between Native communities in the United States and Canada and those in Latin America and the Caribbean and invites a hemispheric understanding of the relationships between Native and mestiza/o peoples. Through path-breaking approaches to transnational, multidisciplinary scholarship and theory, the chapters in this volume advance understandings of indigeneity in the Américas and lay a strong foundation for further research. This book will appeal to scholars and students in the fields of anthropology, literary and cultural studies, history, Native American and Indigenous studies, women and gender studies, Chicana/o studies, and critical ethnic studies. Ultimately, this deeply informative and empowering book demonstrates the various ways that Indigenous and mestiza/o peoples resist state and imperial attempts to erase, repress, circumscribe, and assimilate them.